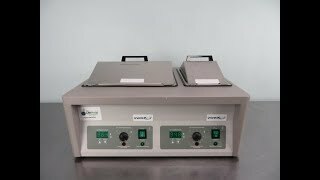 The VWR 1255 is a dual chamber water bath used for a wide range of Life Science applications. The water-bath has a temperature range of ambient to 99°C and comes equipped with easy to use push button controls. The VWR 1255 dual chamber bath is constructed out high quality materials built for long continuous usage. The left chamber on the water bath has a 14 liter reservoir and the right chamber can house a maximum of 6 liters. The VWR 1255 is microprocessor controlled and has a digital display readout for temperature. The dual chamber waterbath has a couple of safety features which include an over temperature lamp alert and built-in special temperature coated power cord. Chamber Size: 12" x 6" x 6" / 12" x 13" x 6"
Dimensions 24 x 19 x 14"
This VWR 1255 Water Bath has been tested to it's full capacity and temperature range and is performing at factory specification. All of our lab equipment comes backed with our standard warranty. Should you have any equipment for sale, please let us know.